Competitive prices. Quality material. Timely delivery. Reliable service. Those benefits are just the start of what you will receive when you choose to work with WholesaleDeckingCo.com. For over 20 years, our premium-grade hardwood decking products have been featured in large scale commercial applications. Builders, planners, and architects know that with each custom order they place, their deck, boardwalk or building project will stay on schedule, and be in line with their budget. We specialize in the most popular and reputable exotic wood materials: Ipe, Cumaru, Tigerwood, Garapa, and Massaranduba. Learn more about these species at our wholesale decking products page. We also feature many gorgeous pictures of our lumber in use, as well as some pictures of our lumber mill, so you can get a better feel for what we are about. 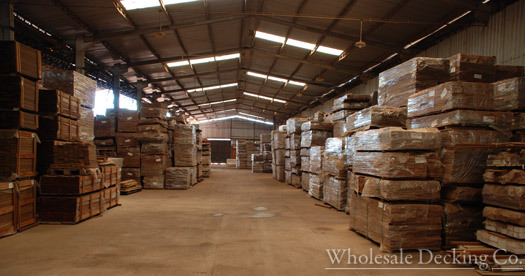 Extensive inventory of hardwood decking bundles by the truck or container load. When you are ready to order your wholesale decking, head on over to our contact page. We have a convenient online contact form to make it as easy as possible for you to buy from us. We look forward to hearing from you!